What is your sports betting goal? Each answer above leads to different behavior. If you are doing this purely for entertainment and don't care much if you lose a few bucks on average, that's fine. We all spend money all the time on "entertainment," knowing full well we are going to part with some money to have fun (think about going to the movies or going out to a nice dinner, for example). If this is the main reason you bet on sports, then the rest of this article may not hold much relevance for you. Of course you want to win and you enjoy it more when you do, but you may not be motivated to work hard to give yourself the extra edges that are out there. However, if your primary goal is to win money (or minimize your losses), then you need to be prepared to do what it takes to give yourself the absolute best chance to win. If your primary goal is to win, then you must do more than make (or buy) good picks. That is a key ingredient. But, if you want to win the most you can, you need to do more than just play good picks. You also need to shop for the best lines and odds. Let's say you bet on the Broncos to win this bet (cover a spread of 7 points). Since the bet has a line of -7, the Broncos need to win the game by 8 points or more for us to win our bet. If they win by less than 7 points (or lose) then we lose our bet. If they win by exactly 7 points, we push. Let's say we make that bet and the game is decided by 7 points. We push our bet meaning that we don't win or lose. Bummer. Wouldn't it have been nice to win that bet? Maybe we could have. If we shopped around and found a better line (for example, Broncos -6.5) then we would have won our bet. Much better! The reality is that if you have multiple sportsbook accounts, you can shop for a better line and find one enough of the time to make a real difference. This can turn losers into pushes or wins and turn pushes into wins. Over the course of a long season, just a few of these can add up to enough extra profit to as much as double your winnings (or cut your losses in half). This tactic alone can turn a losing season into a winning one. You won't find a better line every time, but it happens more often than you might expect. Let's say we make 2000 bets in a year, all at -110 odds (we risk $110 to win $100). Let's also assume that without line shopping we win 1040 of our 2000 bets and lose 960 (52% win rate). In that scenario, we would lose 13.6 units on the year - a disappointment for sure. Now let's say we make those same 2000 bets but in this scenario we take advantage of line shopping, searching for the best lines for every bet. Let's assume that we are able to now win just 2% more of our bets: we go 1080-920 instead (54% winners). In this case, we win 62.8 units on the year - a huge success! As a result of line shopping, we go from a losing year to a nice winning one, playing the exact same picks! The scenario above is very realistic. Most people know what the above (-110 means). The odds on that bet are -110. That means that you have to risk $110 to win $100 (or $11 to win $10). The 10% difference is the house's built-in edge. They pay you 10% less when you win compared to what you pay them when they win. This may not seem like a lot, but it is. At -110 odds, you must win 52.38% of your bets to break-even instead of 50%. That 2.38% is a really big difference and it often means the difference between winning and losing. In hockey and baseball, the most popular bets are moneyline bets. In a moneyline bets, there is no "line" - just odds. You are laying certain odds to bet on a team to win their game outright. Getting better odds on these bets can again have a big impact on your bankroll at the end a season. What if we could cut the house edge in half? Would that lead to more winning overall? You bet! Well, you can cut that edge in half by having multiple sportsbook outs. Odds vary across sportsbooks. It's not uncommon to find about a 5-basis-point odds advantage through line shopping (i.e. getting -105 instead of -110 or getting +115 instead of +110). 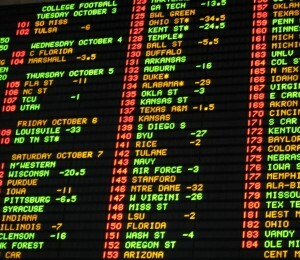 There are actually sportsbooks that specialize in offering better odds across the board. A couple of examples of such a "reduced juice" sportsbooks are 5dimes or Pinnacle Sports. As we have seen above, we can win more bets by shopping for better lines. The impact of increasing our win rate by just a few percentage points can turn a losing season into a winning season, or make a winning season that much better. We can also cut the bookmaker's edge in half simply by shopping for better odds. By finding an average of 5-basis-points of extra value in odds, we can reduce our required break-even win rate from 52.38% to 51.21%. That can essentially double our profit in any given season. Is managing multiple sportsbook accounts easy? Not really. It takes some work and discipline. But, if winning is your primary goal, or you want to treat this endeavor as a business, it's a must. The impact is simply too large to ignore.